Sunburn Pune Gig Shut down by the Cops, organizers to announce new dates! The incredible Sunburn Festival was held in Pune on Sunday, 7th December, 2014 was expected to feature International talents such as Carnage & Sebjak. The people in the city went bonkers as the D-Day came close. The Blue Frog amphitheater was filled with Pune’s first time Sunburner’s and lovers of electronic music. Local DJ’s Ashtrix and Zavion opened festival with an uplifting set of house music for 60 minutes and set the party mood on. The next slayer of the console was India’s EDM poster boy, Anish Sood. He started his set by playing Tujamo’s remix of ‘The Reward is Cheese’ by deadmau5. As the drop came close, nobody could resist keeping their hands up in the air. Drop by drop, the people went crazy and the jumping knew no limits. As the sun set, it was time for the first international headliner, i.e Sebjak. A Swedish house maestro working under Steve Angello’s SIZE label played some groovy tunes ranging from Kryder’s ‘Jericho’ to Daft Punk’s ‘Harder Better Stronger Faster’. As 45 minutes passed, the unexpected happened. Cops instead of photographers were on the stage and quickly the music stopped. Sebjak, the organizers and the volunteers had to face the angry police and the much more furious crowd. An hour passed by and no announcement was made. The Peace, Love, Unity and Respect between the people for the genre made the people wait in the chilly weather for Sebjak to resume his music and for the main headliner to create Carnage (Pun Intended). More minutes passed by and still there was no announcement. People kept chanting and disrespecting the cops and organizers. As the people realized it was too late to revive the festivals, they started rolling out. DJ Carnage could not play and the crowd started chanting ‘refund’ and ‘reschedule’ on a loop. Everyone was disappointed because they could not dance to a trap and electro house filled set, not even a single minute of DJ Carnage. The hunger for listening to Carnage was still very much alive. The cops entered the amphitheatre and had to throw the people out when most of them refused to leave. 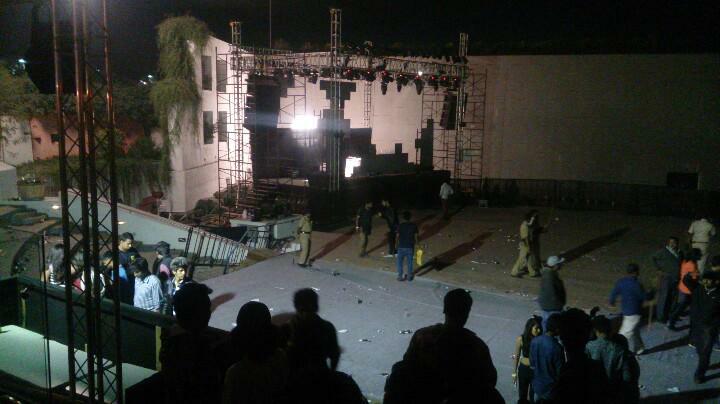 Dash Berlin, a few years ago in Pune, had the same fate when his gig was crashed by the mighty police. However Sunburn Festival posted on their Facebook Fan page yesterday evening that new dates for Sunburn Pune will be announced soon and the existing pass holders will get free entry for the same. Next article Watch the emotional #ABGT100 Aftermovie!